Once per turn, during your Main Phase: You can discard 1 monster; add 1 “Mirror Force” from your Deck or GY to your hand. If this Set card is destroyed by your opponent’s card effect and sent to your GY: You can Set this card from your GY and 1 “Mirror Force” from your hand, Deck, or GY. They can be activated this turn. Mirror Force Launcher is a tribute to all the Mirror Force cards that have come before it. A Continuous Trap that searches a “Mirror Force” every turn for the cost of a monster discard. A 1-for-1, but one that can put you ahead and your opponent on their heels. If set and destroyed by your opponent, you can reset it and search a “Mirror Force”, and the “Mirror Force” can be activated this turn. This is great and all, but “Mirror Force” cards best work when they surprise their opponent. You can get the maximum out of them that way. Showing your opponent that you have a “Mirror Force” will likely cause them to dedicate a resource quicker to destroying it, or pull back and commit less, which could be beneficial to you. A card the legendary original deserved. 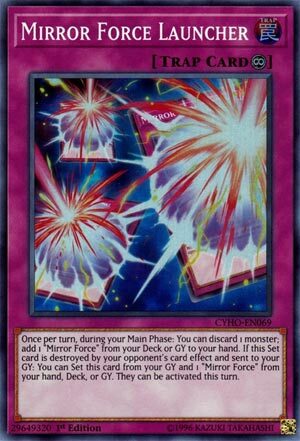 Appropriate you need to discard a monster and not just any card, as “Mirror Force” cards only go after monsters. With Mirror Force probably being my favorite Trap Card of all time, it is nice to see it get a piece of support in 2018 in Mirror Force Launcher. Mirror Force Launcher is a Continuous Trap that once per turn, during your Main Phase, you can discard a monster to add 1 Mirror Force from your deck or GY to your hand. Note that it isn’t Mirror Force card, so you specifically have to search for Mirror Force. Now, Mirror Force is a great card still, but what makes it best is the surprise factor it has when activated. If you search for Mirror Force, the surprise is gone and your opponent will play around it. It is good for mind games, but Mirror Force is better as a surprise. If your opponent destroys this set card, you can set this and 1 Mirror Force from your hand, deck, or GY and they both can be activated that turn. Nice to make the Mirror Force you get off this live immediately since this is likely being destroyed on the opponent’s turn. Again, the problem is the surprise of the Mirror Force is gone and your opponent will just play around it, and it won’t change much if they are very smart about it. Mirror Force Launcher is good in practice, and mind games are always fun to have, but again Mirror Force was always good for being a surprise, though it would probably be better if at least it could get any of the Mirror Forces. Art: 2.5/5 So many Mirror Forces! This strikes me as one of those cards with too much text, and could be more concise, but whatever. This Trap is a Mirror Force searcher/setter that lets you play it the turn your Set it…and it can cycle itself, but only if your opponent destroys it while Set, and only if it goes to the Graveyard. Which, realistically, can happen. It’s interesting that it can fetch any Mirror Force card. I don’t feel you play Mirror Force variants (as in more than one in a Deck of whatever you choose, if you’re playing it/them at all). Theme support for a card is good, even if it’s a Trap card. Strange as that may be. The Continuous Trap part is not good, but that very seldom is. The other effect that you discard a Monster to get a Trap doesn’t make sense to me. I feel to get a Trap, maybe you should…discard a Trap. So that make this a -1, at least the first time (this card, plus a discard) to fetch a card. This versatility from either effect on this card as to where the chosen Force card can come from is an asset. But your opponent as well is going to know you’re pulling these cards, and that can be played around. Good idea here…decent idea anyway, and just not enough, not necessary, I think not.